A bearded Hannah Skeldon in front of the British Women Climb exhibition. The BMC stand at Kendal Mountain Festival (KMF) was looking spectacular! People brought the ghosts of mountaineering past back to life in our polaroid photo competition and our British Women Climb exhibition garnered a lot of love. 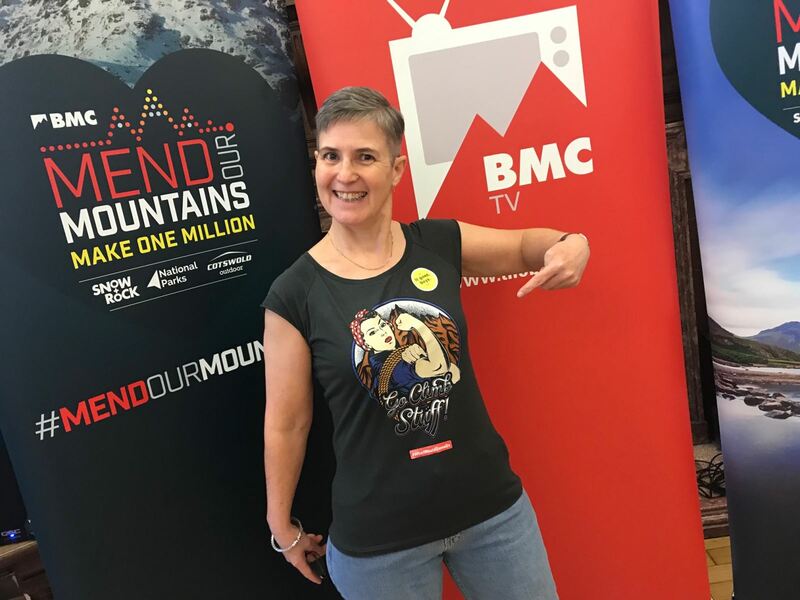 The exhibition celebrated women in mountaineering and climbing through the ages, from the likes of Lizzie Le Blond (aka Elizabeth Hawkins) with what’s likely the first mountain selfie all the way up to two-time Boulder World Cup Champion Shauna Coxsey. Not to forget, we had the Sprayway suit on show that Alison Hargreaves used when she climbed Everest without bottled oxygen to become the first woman to ever do so. We must say hats off to Hannah Skeldon, manager of the BMC Shop, for curating such an inspirational collection of British women. Basecamp was buzzing too! KMF seemed the busiest we’ve ever seen it, with a steady stream of festival-goers passing by to enjoy all the talks, presentations, films and competitions on offer – even a giant snow globe to get inside filled with biodegradable vegetable starch for snow from Montane! How do you like your eggs? Well this time they came scrambled at BMC TV Breakfast Club. The fastest selling event of #Kendal18 took no prisoners, and a crowd of delighted and dazed spectators funnelled out the cinema doors at the end. What went on? A collection of pleasing films, including a Dawn Wall 2 trailer specially edited by the BMC’s new marketing co-ordinator Emma, and the film about the BMC’s own James McHaffie absolutely obliterating yet another E8 in Fairhead paired with a banging Russian dance track from Ricky Bell. Loads of fun, especially during the tug of war between pro climbers and members of the crowd, Niall Grimes did an amazing job of keeping the laughs bubbling and the atmosphere buzzing, and there were more prizes than ever thrown into the hungry crowd. Big thanks to Montane, the BMC's recommended clothing and pack partner, DMM, Marmot, Petzl, Black Diamond, Five Ten and Climb Skin for supplying them! Lynn Robinson, the BMC's first female president, was there at KMF throughout the weekend. Often found dressing up in the props from Mountain Heritage Trust, persuading people to join the BMC, and was the key speaker at the BMC Trade and Media Press Event. Thanks to everyone that came to the press event to hear the positive updates about the BMC's bright future from president Lynn Robinson, vice president John Roberts and CEO Dave Turnbull. Lynn and her husband Steve were more than willing to help out in everything, no matter the task. And we're almost positive Lynn's mighty pull during the tug of war at Breakfast Club was the felling blow to the opposing team! Lynn proudly sporting the Go Climb Stuff t-shirt made especially for KMF! We're sad it's over, but plans are already being made on how we can make the next KMF bigger, better, and bolder! Keep an eye out for when tickets go on sale for our new and exciting event, the upgrade to Breakfast Club. Everyone will be raving about it all night!